110v 60 Hz & 220v 50 Hz Shore power via step down Transformer. Cutter fore stay & fixed boom removed to give an uncluttered fore deck and a taller rig with in mast furling fitted to improve performance and keep sail handling simple. 110 volt, 5 batteries charged by: engine, shore power, generator 600 A / h domestic battery bank. Portable gasoline generator 1.5 Kw ? Saloon table drops and converts to a double berth. There is also a domestic A/C unit that fits over a hatch for air conditioning in port. Radar Antenna need re installing. Life raft needs service and EPIRB a new battery. Reputedly Bill Lapworth's favorite design and one he owned himself, many of the 95 Cal 2-46's built have completed circumnavigations and this design has achieved a formidable reputation as a robust cruising yacht. This well cruised example has had the cutter fore stay & fixed boom removed, to give an uncluttered fore deck, a taller rig with in mast furling fitted, to improve light wind performance and keep sail handling simple. She is also equipped with an electric winch handle to take the effort out of sail handling. Equipped ready to go cruising with manuals, tools, portable gen set, reference library,and many spare parts and accessories. The engine room has a workbench with standing head room and access from the aft cabin passageway or the cockpit, making routine maintenance simple, and the light and airy interior is air conditioned, with an additional domestic A/C unit for use in port. 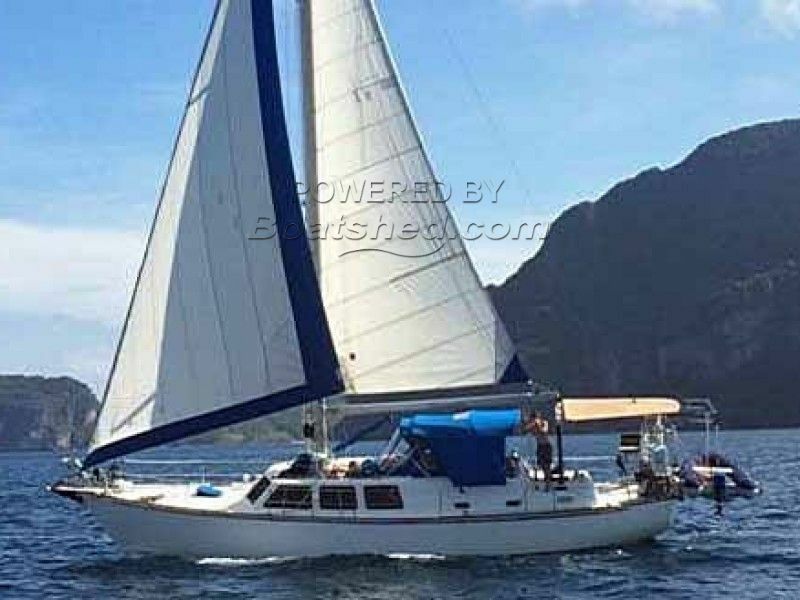 This Cal 2-46 Sloop has been personally photographed and viewed by Alan Giles of Boatshed Phuket. Click here for contact details.